We’d love your help. Let us know what’s wrong with this preview of Game of Secrets by Dawn Tripp. In 1957, Jane Weld was eleven years old when her father, Luce, disappeared. His skiff was found drifting near a marsh, empty except for his hunting coat and a box of shotgun shells. No one in their small New England town knew for sure what happened until, three years later, Luce’s skull rolled out of a gravel pit, a bullet hole in the temple. Rumors sprang up that he had b In 1957, Jane Weld was eleven years old when her father, Luce, disappeared. His skiff was found drifting near a marsh, empty except for his hunting coat and a box of shotgun shells. No one in their small New England town knew for sure what happened until, three years later, Luce’s skull rolled out of a gravel pit, a bullet hole in the temple. Rumors sprang up that he had been murdered by the jealous husband of his mistress, Ada Varick. Now, half a century later, Jane is still searching for the truth of her father’s death, a mystery made more urgent by the unexpected romance that her willful daughter, Marne, has struck up with one of Ada’s sons. As the love affair intensifies, Jane and Ada meet for their weekly Friday game of Scrabble, a pastime that soon transforms into a cat-and-mouse game of words long left unspoken, and dark secrets best left untold. To ask other readers questions about Game of Secrets, please sign up. when you play the game of secrets, you win... or you die. nahhh, nothing as dramatic as that, and not one single dragon. this book is better than it looks, but not as good as i had hoped. it has really beautiful language but really clunky plot. it made my heart swell with its mentions of del's lemonade, lincoln dog park, newport jai alai, and coffee milk. but the relationships, both romantic and familial, left me without heartswells at all. the family secrets were everywhere on the spectrum from "expected" to "bananas." the scrabble subplot, which i had hoped would be an experience of buried secrets doled out within the context of an innocent game, turned out to be just a banal game, with occasional folksy metaphor, ruined by the secret that was on the "bananas" end. seriously -what was that? there were either printing errors in mine that changed characters' names, or characters who appeared and disappeared into the various plots. there was either a lot of character-misperception or really graceless blocking by the author in her attempt to mask the truths of the past, and the importance of the characters therein. in short, there were problems. I don't even know if it's fair for me to review this book because I couldn't finish it. But I feel like if I'm going to give it a one-star rating, I have to explain myself. I saw the author give a reading from this book at the Boston Book Fest and was deeply turned off by it. It occurred to me immediately that she was not reading her writing as a novelist would, but as a poet: she ran sentences together, used no emotion whatsoever, but sort of lifted and dropped the tone of her voice in a robotic I don't even know if it's fair for me to review this book because I couldn't finish it. But I feel like if I'm going to give it a one-star rating, I have to explain myself. I saw the author give a reading from this book at the Boston Book Fest and was deeply turned off by it. It occurred to me immediately that she was not reading her writing as a novelist would, but as a poet: she ran sentences together, used no emotion whatsoever, but sort of lifted and dropped the tone of her voice in a robotic, TS Eliot kind of way. I thought, "Wow, that was pretentious," and had little interest in reading the book for myself, even though the language was, admittedly, very appealing to the ear. In Game of Secrets, the lives of two women, two families are tied forever by a unsolved crime and secrets of the past. In 1957, Luce Weld, father to (12) year old Jane disappeared. Luce was a womanizer who had been having an affair with Ada Varick. Ada was married to Silas at that time, but left her husband the year her son Ray was born. What exactly happened to Luce, is unknown, however in the 1960's a skull with bullet hole in it was found, and it townspeople suspected it could have been Luce. Now in 2004, Jane still has never really gotten over the disappearance of her father. Her relationship with her own adult daughter, Marne, who has just returned back to New England from California, has suffered as well. Marne, soon begins a relationship with Asa's son Ray. Jane, now 60, and Asa, 80, meet for weekly Scrabble games. Initially, not much is discussed about the past, or the affair between Asa and Jane's father, but little by little a power play with words over a weekly board game brings the details of the past to the forefront. I loved this book. I know from this writer's past work that she has the ability to create vivid characters who are equally capable of love and violence. Game of Secrets is her best yet and it asks an important central question: How well do we ever really know anyone? Set in a small New England town and based on a scrabble game between two old friends, Game of Secrets is about the unraveling of a mystery that deeply affected the lives of both women. But, as is often the case in small towns, the p I loved this book. I know from this writer's past work that she has the ability to create vivid characters who are equally capable of love and violence. Game of Secrets is her best yet and it asks an important central question: How well do we ever really know anyone? Set in a small New England town and based on a scrabble game between two old friends, Game of Secrets is about the unraveling of a mystery that deeply affected the lives of both women. But, as is often the case in small towns, the past is still very alive in the present so that mystery and the web of secrets around it has an impact on the modern day lives of their children. The ending manages to be both surprising and inevitable - and it will send readers scrambling back through the pages, wondering how they could have missed the clues. I won this as part of Goodreads Firstreads Giveaway-thank you! In 1968, Jane Weld was 12 years old her when her father, Luce, went missing. At the time he was having an affair with Alda Varick and her jealous husband was always considered a suspect. Now it is decades later and Jane's daughter, Marne, has struck up a relationship with one of Ada's sons. Jane herself meets once a week for a Scrabble game with Ada and during the game the two of them share detailed memories of the past. While Dawn Tr I won this as part of Goodreads Firstreads Giveaway-thank you! This haunting, exquisitely written novel is about the secrets we choose to tell and the ones we want to keep. I was mesmerized from page one. Over the course of a board game, two women reveal their paths--and each other. You quickly become deeply invested in both the characters and the plot, and it's no wonder that Tripp has the stellar literary reputation that she has. Game of Secrets...I did enjoy the prose style. I thought the imagery in some of the passages was beautiful. I did find in parts of the book that the prose could get a little thick which slowed down the progression of the book. There were other places in the book where the prose was more clean and strait forward and then the pace of the story would speed up. I definitely felt the tenison in the story and I kept waiting for something tragic to happen in the present. (2004) As readers we already kne Game of Secrets...I did enjoy the prose style. I thought the imagery in some of the passages was beautiful. I did find in parts of the book that the prose could get a little thick which slowed down the progression of the book. There were other places in the book where the prose was more clean and strait forward and then the pace of the story would speed up. I definitely felt the tenison in the story and I kept waiting for something tragic to happen in the present. (2004) As readers we already knew about Luce's death. I didn't understand why Marne despised her mother so much. Alex grew up in the same household and he seems fine. There is only one passage that alludes to the discontent and that is at the end of the novel when Jane says.. "It was mine, that fear she was feeling. From the time she was a child, I had wrapped her in it like wet shadows." So Jane was in a depression over the death of her son Samuel and she inadvertantly neglected and transferred her fears to Marne and Marne picked up on her mother's emotions and made them hers? Huh I guess what I'm saying is that the dysfunctional hows and whys of that relationship, Marne's and Jane's, was not clear to me. Because of that I found Marne to be unsympathetic especially when she self-sabatages her relationship with Ray. I'm just aggravated with her. The comments around her are ..when will she grow up..making a mess of her life again..yet we really don't know anything about her. I found myself mulling over this character with questions like..Why didn't she ever talk to her mother? She's an adult, lived on her own out of state, she couldn't step into the breach and open her mouth. For Pete's sake as an adult you would think she would reach out and talk to her mom. And then she questions her dad with "Why did you marry her?" Like her mother was so difficult and crazy or something. Again Alex (Jane's son) seems to be just fine. And then just like that Marne resolves herself to her mother's "way of being." Like all of a sudden she just gets her. It didn't jive for me. One more thing. I was confused a bit about the socio-economic status these characters hold. The men are fisherman,and hunters. The woman don't work. Jane's house had a privy out back when they first bought it and it had exposed pipes in the kitchen. Ada has a delapidated shack on her property that Huck hangs out in. She moves it to a piece of land she has. Ada seems insightful at times but talks like a sailor others,as does Marne. There is mention of big summer homes and summer visitors. I felt like the year-round residents of the area were poor yet the women read quite a bit. Self-educated? And would Huck at fourteen really wax poetic the way he does in his mind when he thinks or sees Jane. I know it is the author's style of writing but for that character she could have been a more real with his thoughts. (He suffered abuse and was filled with anger as well). I guess this book raised more questions for me than it answered. 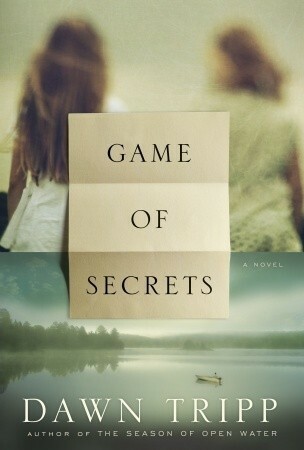 Set in a small New England town, GAME OF SECRETS is a novel told from multiple points of view in different time periods. Two aged women playing a game of Scrabble with a tangle of shared, unspoken, family tragedies, a pair of young lovers meeting in secret in an old barn, an unearthed skull with a bullet hole revealing a decades-old murder, and a guarded daughter trying to find where she fits into her town and her family provide the framework of the book. The stories weave together through time Set in a small New England town, GAME OF SECRETS is a novel told from multiple points of view in different time periods. Two aged women playing a game of Scrabble with a tangle of shared, unspoken, family tragedies, a pair of young lovers meeting in secret in an old barn, an unearthed skull with a bullet hole revealing a decades-old murder, and a guarded daughter trying to find where she fits into her town and her family provide the framework of the book. The stories weave together through time like the tiles of the game, surprising the reader how they fit together at every turn. There are some books I love for the characters, the people who seem real enough to step off the page and into the room. There are other books I love for the author’s use of setting as a canvas that sets off the colors of the story like no other background could. Sometimes I love a book for plot and pacing that keeps me turning pages late into the night. All of these elements are present in GAME OF SECRETS, but if I had to pick what I loved most about this book, it would be the prose. Dawn Tripp’s command of language takes a story that has all of the above elements used well, and further elevates it. Every description, every use of figurative language, every theme supports the story around it including the character whose narrative encompasses it. I found almost all of the characters endearing except one, and even that character had redeemable qualities. I cared most for Marne, even when she was judgmental of and impatient with her mother, because Marne always tried to understand more by pouring over her mother’s notes in an old library book. Marne tried to find the thread that connected her to her mother–a thread that Marne intuitively felt but had a hard time recognizing in her conscious mind. There is a thin line between literature that is florid and pretentious, and literature that is lyrically beautiful. This novel is definitely the latter. A compelling story of many people, told on two separate but related timelines, this story of loss, love, and finding oneself is utterly satisfying in every regard. The author clearly loves her wordplay, though it does not bog down the story. The characters are flawed and real, the setting achingly realistic (as anyone who grew up in a small coas There is a thin line between literature that is florid and pretentious, and literature that is lyrically beautiful. This novel is definitely the latter. A compelling story of many people, told on two separate but related timelines, this story of loss, love, and finding oneself is utterly satisfying in every regard. The author clearly loves her wordplay, though it does not bog down the story. The characters are flawed and real, the setting achingly realistic (as anyone who grew up in a small coastal town can attest to), and the story poignant and moving. I highly recommend this one! Poetic writing and a plot that takes you to the event, the place and the time frames this is set in. Dawn Tripp's book excels in a way that writers today no longer are able to master---making you think as a reader. Beautiful writing. Evocative in the way fragments of stories and time interface and finally amass into a whole. Thoroughly enjoyable. Voices are clear and distinct, and you don't see a lot of it coming. Synopsis: In 1957, Jane Weld was eleven years old when her father Luce, a petty thief, disappeared. His skiff was found drifting near the marsh, empty except for his hunting coat and a box of shot-gun shells. No one in his small New England town knew for sure what happened until, three years later, his skull rolled out of a gravel bank by the river, a bullet hole in the temple. There were rumors he had been murdered by the jealous husband of his mistress, Ada Varick. Now, half a century later, Jane is still searching for the truth of her father's death, a mystery made more urgent by the unexpected romance that her willful daughter, Marne, has struck up with one of Ada's sons. As their love affair intensifies, Jane and Ada meet for a casual Friday board game that soon transforms into a cat-and-mouse game of words long left unspoken, dark secrets best left untold. My Thoughts and Opinion: A murder in a small town in 1957 that was never solved until 2004. Two families connected and affected, due to this murder, and the effects of infidelity that was always thought was the reason behind the murder. But who did it? Two damaged families, for generations, connected through friendship and romantic interests, and bound together by lies, betrayal, mistrust, protection and the search of the truth. For me, this is one of the hardest reviews I have had to write because of the following. After reading the synopsis, I started reading this book with a preconceived notion, expectation and presumption of what the premise was. I was wrong and because of my assumption, I was disappointed with the outcome. After I finished reading this book, I did read others' reviews, which the majority were 4 and 5 star ratings, to see if I was in the majority or minority of my rating. I was in the minority. I feel that it is not fair to the author and/or the book, because of my inference, that you make a decision to read and/or not read this book because of my opinion. However, since I do post a review of every book I read, I will share my thoughts. It was very hard for me to relate to the characters. I thought that one character, Marne, granddaughter of the murder victim was not developed. It was conveyed that she had "come home" but I was unsure as to why. Plus she had a "chip on her shoulder" attitude and a very troubling relationship with her mother, Jane, daughter of the murder victim, Luce, but the reason for this was not explained. Another issue I had trouble believing was the friendship between Jane and her Scrabble opponent, Ada, who was her father's mistress and the person who broke up Jane's parents' marriage, which Jane had never truly accepted. One of my assumptions was that the words formed during these weekly Scrabble games produced would be hints as to who the murderer was. The author did describe each game, the words created and how many points the player achieved. However, I didn't feel that the words played had anything to do with the long ago murder of Jane's father but it was the conversations the 2 woman had during their weekly scheduled games. The book held my attention and was a fast read but I think it was due to the fact of trying to figure out who the killer was. I didn't feel that is was a page turning suspense but a page turner to just find out the truth. I want to stress that this is my opinion, and my opinion only. Not every book is for every reader. And according to the reviews, a lot of people disagree with me. Nonethe less, this is my personal viewpoint of this book. This story spans generations, but the protagonist is in the present. Is it Marne, the bitter young woman who has come home for a while? Or her mother Jane? It seems that Jane figures most in the actions, so I'll call it for her. Marne has returned home from California and doesn't know what her next move will be. She is irritated by her mother, as she has been for years, and is again finding herself attracted to h I registered a book at BookCrossing.com! Marne has returned home from California and doesn't know what her next move will be. She is irritated by her mother, as she has been for years, and is again finding herself attracted to her brother Alex's best friend Ray. Resistant to anything too intimate, Marne nevertheless decides to try him on. Meanwhile, Jane has been playing chess with Ray's grandmother Ada. Ada may have the key to a mystery Jane has been mulling over since she was a child: what happened to her father. Ada's father Luce had been seeing Ada on the sly when one day he disappeared. As the chess games continue, Jane pumps Ada. This isn't a straightforward mystery, in which the characters clearly state what they want or what they want to know. They may not know. There are a few odd bits that had me wondering about the timeline. For example, Marne mentions being a teen "thirty years ago" in one place, and then later notes that she is in her thirties. Also, Ray is Ada's son while Marne is Luce's grandson. Possible of course, just a little confusing. I won this as part of Goodreads Firstreads Giveaway. Game of Secrets is the story of a family. Jane Weld was the daughter of Luce, a man who went missing many years before under mysterious circumstances. At the time of his death, Luce was having an affair with Ada Varick, and when Jane got older, Ada became her best friend. Now old ladies, they play Scrabble together in the park. When Jane's daughter Marne becomes sweet on Ada's son, the tension between the family appears to have dissipated a bi I won this as part of Goodreads Firstreads Giveaway. Game of Secrets is the story of a family. Jane Weld was the daughter of Luce, a man who went missing many years before under mysterious circumstances. At the time of his death, Luce was having an affair with Ada Varick, and when Jane got older, Ada became her best friend. Now old ladies, they play Scrabble together in the park. When Jane's daughter Marne becomes sweet on Ada's son, the tension between the family appears to have dissipated a bit. The teaser I read for this book was misleading. It was described as a murder mystery, that the skull of a man was found with a bullet hole in it and this brought up the possibility that Luce didn't die from drowning. But it has none of the page-turning excitement of a murder mystery because this is more of a social drama. The mystery of Luce's disappearance is kind of an afterthought. The Scrabble scenes were confusing. When I was reading them, I was trying to figure out the words, to see if they were clues to the underlying mystery. But they weren't; the author described these long scenes are almost no purpose other than to show the Jane and Ada relationship. Over and over again. I received Game of Secrets in a Goodreads giveaway, and, to be honest, left it sitting on my bedside table for a month. I was uncertain how this "literary thriller" tied to a weekly Scrabble game was going to play out. I dreaded reading one of those dramatic, depressing stories where a parent or a child has to betray the other for the common good. The promotional quotes proclaiming it to be a thriller is misleading. A thriller implies hot and fast and dramatic unfolding. Game of Secrets was quie I received Game of Secrets in a Goodreads giveaway, and, to be honest, left it sitting on my bedside table for a month. I was uncertain how this "literary thriller" tied to a weekly Scrabble game was going to play out. I dreaded reading one of those dramatic, depressing stories where a parent or a child has to betray the other for the common good. The promotional quotes proclaiming it to be a thriller is misleading. A thriller implies hot and fast and dramatic unfolding. Game of Secrets was quiet and deep and strong. It was so much more than I expected. Dawn Tripp slowly unfolds a story spanning several generations, reinforcing how the actions of one generation ripple to their children and grandchildren. There is some dramatic mystery to the secrets of the story, but most of the secrets are those that all of us hold as we work our way through life. The secrets that parents hold from their children and children from their parents. The ones we know are inside the ones we love and are afraid to ask or tell so we don't hurt them or ourselves. This was a very quick read and beautifully written. I like the way all the stories intertwined with these families. How Jane is now friends with the woman who was her father's mistress 50 years before - and her daughter and Ada's son are flirting with an attraction that is growing between them. The three women - Ada, Jane and Marne - play the larger roles in this story and while the men they love (or who love them) figure in to the story, it is the women who you learn the most about. While the s This was a very quick read and beautifully written. I like the way all the stories intertwined with these families. How Jane is now friends with the woman who was her father's mistress 50 years before - and her daughter and Ada's son are flirting with an attraction that is growing between them. The three women - Ada, Jane and Marne - play the larger roles in this story and while the men they love (or who love them) figure in to the story, it is the women who you learn the most about. While the story could not happen without them, these men seem sometime incidental. It gives the impression that life, love, family, history is all moved forward or sometimes stilted based on the women. A lot of the story is learned as Ada and Jane play their weekly game of Scrabble. The words played or changed hint as to what lies in the past. As to the murder of Luce, it had never been solved, though the women each had their beliefs as to what happened. It isn't the only mystery/secret that is discovered through the course of the book though. One secret was obvious to me - the other was a secret until the end! I'd give this a 2.5. I read Dawn Tripp's earlier novels and loved both of them. Sadly, this novel didn't quite measure up to these two earlier works. I found it rather disjointed, and for some reason, I had a hard time keeping track of the relationships between characters. There was a fair amount of emotion around certain characters that I didn't think was fully explained. One particular character appears along the periphery of Jane's life but then seems to fade out without a reason for his appe I'd give this a 2.5. I read Dawn Tripp's earlier novels and loved both of them. Sadly, this novel didn't quite measure up to these two earlier works. I found it rather disjointed, and for some reason, I had a hard time keeping track of the relationships between characters. There was a fair amount of emotion around certain characters that I didn't think was fully explained. One particular character appears along the periphery of Jane's life but then seems to fade out without a reason for his appearance. Finally, I never quite understood why Marne had such a difficult relationship with her mother. This one is definitely a read again some time in the future. It has layers of complexity that will offer up something new the second time around. story was decent enough, i was pleasantly surprised by the twist in the last chapter. the writing was a bit more "stream of conscious" than i like. A good read but I found it confusing and hard to keep the characters straight - a lot of jumping back and forth in time and between characters. It was one of those books that I needed to finish to try and figure how everyone connected! The prose is beautiful. I particularly descriptions of two characters interacting during a scrabble game. The plot is weak. I expected more from this short family drama. Beautifully written story. Although, I'm pretty sure some of it went over my head. Recommended in an essay of Roxane Gay's in Bad Feminist. Game of Secrets is the story of small town life and how one act can influence many generations. While the main story in the book is of Jane Weld, there are many other smaller stories happening at the same time that all come together. Jane was eleven years old when her father disappeared. Three years later, his skull was found with a bullet wound. While nobody knew for sure and nothing could ever be proven, it was believed that he was murdered by the angry husband of his mistress, Ada Varick. Now many years later, Jane and Ada have formed a somewhat strange relationship. They meet every Friday for Scrabble and have bonded over their combined loss. At the same time, Jane's daughter, Marne, has started dating Ada's son, Ray. While Marne has loved Ray for years, things done in the past and family secrets are hard to forget and their relationship is strained and tested almost immediately. The story alternates between time and characters. We hear from Jane, past and present, as well as other members of her family and of Ada's. The story works back and forth to bring out the truth about Jane's father and the repercussions the two families have lived with since his death. I'll be honest and tell you I had a hard time getting into this book. While it was somewhat short, less than 300 pages, it still took me a long time to get through it. I think this was due to the author's writing style. It was heavy, the words very deliberate and almost every sentence a clue with double meaning. Sometimes I had to go back and read them again to make sure I was getting every bit of information the author was trying to tell me. Because of this, the beginning seemed to really drag. It took me days to get through just seventy pages. I kept at it though, and things really started to take off in a much better direction. I got used to the style of writing and started picking up on the small clues hidden in those words that ultimately led up to a satisfying read. Each character we hear from in this book had their own story to tell, each struggling with something they so desperately want to change or forget. Jane wants to know what really happened to her father all those years ago and she wants to know what Ada knows. Marne, Jane's daughter, is struggling with her feelings for Ray and the way she distances herself from her family. Her relationship with her mother is strained and she is unable to move past it. Of all the characters, the one I found myself most intrigued by was Huck, Ray's brother and another of Ada's sons. He was just a young boy when Jane's father went missing, but he remembers the fighting between his parents and even his secret love for Jane, someone who doesn't even notice him. Marne seems to hold a deep hatred for Huck, although it isn't immediately clear why. As the story progresses, we hear more from Huck as a teenager and learn more about his life growing up in a difficult household. I felt sorry for him and wanted better for him even though I knew where his life was going. Game of Secrets is not a book to breeze through. It is one that needs to be digested slowly, giving you time to connect those clues and really take in all those things left unsaid but somehow still known. There are many secrets hidden in these pages, secrets that have been buried deep for years and just may shock you once they come to light. I recommend Game of Secrets to anyone who is in the mood for a good mystery, putting the puzzle together piece by piece until all is revealed. How we play that particular game can reveal so much about how we tick, how we live, who we are. Some play to keep the board open; some play to shut it down. Some play with an eye to the sum of the total scores of all players; some play, simply, to maximize their own. Most players will look at the board and see the words that fill it. But a really good player, a canny player -- and she was one of those -- will also see opportunity in the skinny spaces still left open in between. 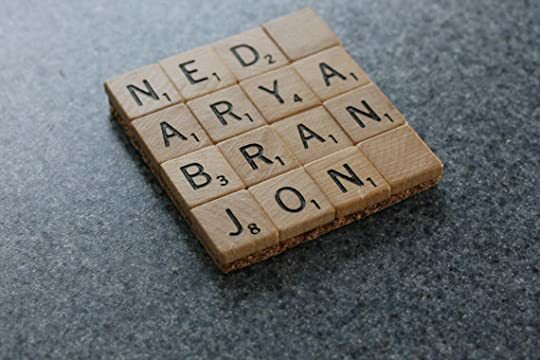 [...] The unfolding of the mystery at the heart of Game of Secrets comes to mirror the playing of the Scrabble game: clue after clue is revealed, the story comes together piece by piece; disparate letters are arranged into words, which, in turn, are arranged into a larger grid. The game became the perfect lens for this story of two women, two families bound together and divided by unspeakable secrets, a brutal past, a murder, a love story. In the early stages of a book, I turn my back completely on that adage "write what you know." I write what I am impelled by. I start where I feel led to start. Sometimes I draft a sequence toward the opening. More often I will draft the ending first. For months I write longhand, sometimes on little slips of paper, receipts, grocery lists, throw-away things that I then transcribe into notebooks, and from there to my laptop. I am particular about who I show my work to, and when. Not out of fear of judgment, but because when I am really living in a story, I am open. And I have a certain faith in that openness. I don't polish my drafts up too soon. I leave notes in the margins, some passages entirely without punctuation. I leave things untidy, open to change. I find that when I can let myself stay open to possibilities in a story that I may not yet have uncovered, when I can let myself be driven by what I do not yet know, the story often turns, deepens, in unexpected, revelatory ways. At a certain point, when I have generated about 120-150 pages of story material, I begin to outline. I map the larger arc of the story against a five-act structure: inciting incident, rising action, climax, falling action, denouement. More essential, I feel, than outlining is creating arcs. I map each subplot arc against the larger story arc. I map an arc for each character, so that each character changes in some significant way to advance the turns in the plot. Each of those smaller arcs -- subplot, character, etc. -- help drive the main arc of the story. An emotionally woven wooden roller coaster ride. As you partake in Game of Secrets you awaken your senses to a place and time that feels familiar as if you yourself have been there before. The characters in this novel feel frozen in time as emotions ripple through with every turned of the page. The main characters have so much in common yet they keep those emotions encased within themselves as if waiting for someone to come along and crack their shells. As the story unfolds it weaves back and for An emotionally woven wooden roller coaster ride. As you partake in Game of Secrets you awaken your senses to a place and time that feels familiar as if you yourself have been there before. The characters in this novel feel frozen in time as emotions ripple through with every turned of the page. The main characters have so much in common yet they keep those emotions encased within themselves as if waiting for someone to come along and crack their shells. As the story unfolds it weaves back and forth between not only different characters but also the past and present, as different characters are place into the limelight. The main characters consist of three women Jane, Marne her daughter and Ada Varick the former mistress of Jane's father. Jane meets weekly with Ada for a game of scrabble as the past unravels between them. While Marne, Jane's daughter who is in her 30's and now back living at home with mom and dad has given in to old feelings for Ray the son of Ada. Game of Secrets is the story of two families that are twisted together by a budding romance, an affair, and a murder. In 1957, Luce Weld was murdered by a gunshot to the head. At the time of his murder he was having an affair with Ada Varick. It is widely believed that Ada’s husband, Silas, is the one who put the bullet in Luce. Jump ahead to 2004, Jane age 60, Luce’s daughter, plays Scrabble weekly with Ada, 80, in hope of learning more about Luce’s romance and eventual murder. Marne, Jane’s dau Game of Secrets is the story of two families that are twisted together by a budding romance, an affair, and a murder. In 1957, Luce Weld was murdered by a gunshot to the head. At the time of his murder he was having an affair with Ada Varick. It is widely believed that Ada’s husband, Silas, is the one who put the bullet in Luce. Jump ahead to 2004, Jane age 60, Luce’s daughter, plays Scrabble weekly with Ada, 80, in hope of learning more about Luce’s romance and eventual murder. Marne, Jane’s daughter , has moved back to New England from California and begins a relationship with her childhood crush Ray, Ada and Silas’ son. I found this book easy to read, but for some reason it didn’t flow well for me. There were many times I had to go back and re-read part of the story. It seemed at times there were run on sentences and too much description and carrying on. I am still not sure what really happen to Luce, did Silas shoot him?